"Billiards" redirects here. For other uses, see Billiard (disambiguation). Cue sports (sometimes written cuesports), also known as billiard sports, are a wide variety of games of skill generally played with a cue stick which is used to strike billiard balls, moving them around a cloth-covered billiards table bounded by rubber . All cue sports are generally regarded to have evolved into indoor games from outdoor stick-and-ball lawn games (retroactively termed ground billiards), and as such to be related to trucco, croquet and golf, and more distantly to the stickless bocce and balls. The word "billiard" may have evolved from the French word billart or billette, meaning "stick", in reference to the , an implement similar to a golf club, which was the forerunner to the modern cue; the term's origin may have also been from French bille, meaning "ball". The modern term "cue sports" can be used to encompass the ancestral mace games, and even the modern cueless variants, such as finger billiards, for historical reasons. "Cue" itself came from queue, the French word for a tail. This refers to the early practice of using the tail of the mace to strike the ball when it lay against a . A recognizable form of billiards was played outdoors in the 1340s, and was reminiscent of croquet. King Louis XI of France (1461–1483) had the first known indoor billiard table. Louis XIV further refined and popularized the game, and it swiftly spread amongst the French nobility. While the game had long been played on the ground, this version appears to have died out in the 17th century, in favor of croquet, golf and bowling games, while table billiards had grown in popularity as an indoor activity. Mary, Queen of Scots, claimed that her "table de billiard" had been taken away by what would eventually become her executioners (who covered her body with the table's cloth). In 1588, the Duke of Norfolk, owned a "billyard bord coered with a greene cloth... three billyard sticks and 11 balls of yvery". Billiards grew to the extent that by 1727, it was being played in almost every Paris cafe. In England, the game was developing into a very popular activity for members of the gentry. The early croquet-like games eventually led to the development of the carom or carambole billiards category – what most non-Commonwealth and non-US speakers mean by the word "billiards". These games, which once completely dominated the cue sports world but have declined markedly in many areas over the last few generations, are games played with three or sometimes four balls, on a table without holes (and without obstructions or targets in most cases), in which the goal is generally to strike one with a , then have the cue ball rebound off of one or more of the cushions and strike a second object ball. Variations include three-cushion, straight rail and the balkline variants, cushion caroms, five-pins, and four-ball, among others. In the United States pool and billiards had died out for a bit, but between 1878 and 1956 pool and billiards became very popular. Players in annual championships began to receive their own cigarette cards. This was mainly due to the fact that if was a popular pastime for troops to take their minds off from battle. However, by the end of World War II pool and billiards began to die down once again. It wasn’t until 1961 when the film "The Hustler" came out that sparked a new interest in the game. Now the game is generally a well-known game and has many players of all different skill levels. At least the games with regulated international professional competition have been referred to as "sports" or "sporting" events, not simply "games", since 1893 at the latest. Quite a variety of particular games (i.e., sets of rules and equipment) are the subject of present-day competition, including many of those already mentioned, with competition being especially broad in nine-ball, snooker, three-cushion and eight-ball. Russian pyramid and kaisa have a size of 68 mm (2 11⁄16 in). In Russian pyramid there are sixteen balls, as in pool, but fifteen are white and numbered, and the is usually red. In Kaisa, five balls are used: the yellow (called the kaisa in Finnish), two red object balls, and the two white cue balls (usually differentiated by one cue ball having a dot or other marking on it and each of which serves as an object ball for the opponent). Carom billiards balls are larger than pool balls, having a diameter of 61.5 mm (2 7⁄16 in), and come as a set of two cue balls (one colored or marked) and an object ball (or two object balls in the case of the game four-ball). American-style pool balls are 57 mm (2 1⁄4 in), are used in many pool games found throughout the world, come in sets of two of object balls, seven and seven , an and a ; the balls are racked differently for different games (some of which do not use the entire ball set). Blackball (English-style eight-ball) sets are similar, but have unmarked of (or ) and balls instead of solids and stripes, and at 56 mm (2 3⁄16 in) are smaller than the American-style; they are used principally in Britain, Ireland, and some Commonwealth countries, though not exclusively, since they are unsuited for playing nine-ball. Snooker balls are smaller than American-style pool balls with a diameter of 52.5 mm (2 1⁄15 in), and come in sets of 22 (15 reds, 6 "", and a cue ball). English billiard balls are the same size as snooker balls and come in sets of three balls (two cue balls and a red, an object ball). Other games, such as bumper pool, have custom ball sets. There are many sizes and styles of pool and billiard tables. Generally, tables are rectangles twice as long as they are wide. Most pool tables are known as 7-, 8-, 8 1⁄2(sometimes called a Pro 8)-, or 9-footers, referring to the length of the table's long side. Full-size snooker and English billiard tables are 12 feet (3.7 m) long on the longest side. Pool halls tend to have 9-foot (2.7 m) tables and cater to the serious pool player. Pubs will typically use 7-foot (2.1 m) tables which are often coin-operated. Formerly, 10-foot (3 m) tables were common, but such tables are now considered antique collectors items; a few, usually from the late 19th century, can be found in pool halls from time to time. Ten-foot tables remain the standard size for carom billiard games. The slates on modern carom tables are usually heated to stave off moisture and provide a consistent playing surface. The length of the pool table will typically be a function of space, with many homeowners purchasing an 8-foot (2.4 m) table as a compromise. High quality tables are mostly 4.5 by 9 ft (2.7 m). (interior dimensions), with a bed made of three pieces of thick slate to prevent warping and changes due to humidity. Smaller bar tables are most commonly made with a single piece of slate. Pocket billiards tables of all types normally have six pockets, three on each side (four corner pockets, and two middle or side pockets). Bar or tavern tables, which get a lot of play, use "slower", more durable cloth. The cloth used in upscale pool (and snooker) halls and home billiard rooms is "faster" (i.e., provides less friction, allowing the balls to roll farther across the table ), and competition-quality pool cloth is made from 100% worsted wool. Snooker cloth traditionally has a nap (consistent fiber directionality) and balls behave differently when rolling against versus along with the nap. The cloth of the billiard table has traditionally been green, reflecting its origin (originally the grass of ancestral lawn games), and has been so colored since the 16th century, but it is also produced in other colors such as red and blue. The cloth was earlier said to be the most important part of the game, most likely because of the reflection of the game's origin. The players were stubborn in the fact that the cloth should not be ripped. They even made women continue to use maces after cues were invented, for fear that they would rip the cloth with the sharper cues. A rack is the name given to a frame (usually wood, plastic or aluminium) used to organize billiard balls at the beginning of a game. This is traditionally triangular in shape, but varies with the type of billiards played. There are two main types of racks; the more common triangular shape which is used for eight-ball and straight pool and the diamond shaped rack used for nine-ball. There are several other types of less common rack types that are also used, based on a "template" to hold the billiard balls tightly together. Most commonly it's a plastic piece with diamond shaped cut-outs that hold the balls that is placed on the table with the balls set on top of the rack. The rack remains on the table during the break shot and can be removed afterward. The end of the cue is of larger circumference and is intended to be gripped by a player's hand. The of the cue is of smaller circumference, usually tapering to an 0.4 to 0.55 inches (10 to 14 mm) terminus called a (usually made of fiberglass or brass in better cues), where a rounded leather is affixed, flush with the ferrule, to make final contact with balls. The tip, in conjunction with chalk, can be used to impart spin to the cue ball when it is not hit in its center. Cheap cues are generally made of pine, low-grade maple (and formerly often of ramin, which is now endangered), or other low-quality wood, with inferior plastic ferrules. A quality cue can be expensive and may be made of exotic woods and other expensive materials which are artfully inlaid in decorative patterns. Many modern cues are also made, like golf clubs, with high-tech materials such as woven graphite. Skilled players may use more than one cue during a game, including a separate generally lighter cue for the opening break shot (because of cue speed gained from a lighter stick) and another, shorter cue with a special tip for . The mechanical bridge, sometimes called a "rake", "bridge stick" or simply "bridge", and in the UK a "rest", is used to extend a player's reach on a shot where the cue ball is too far away for normal hand bridging. It consists of a stick with a grooved metal or plastic head which the cue slides on. Many amateurs refuse to use the mechanical bridge based on the perception that to do so is unmanly. However, many aficionados and most professionals employ the bridge whenever the intended shot so requires. Chalk is applied to the tip of the cue stick, ideally before every shot, to increase the tip's friction coefficient so that when it impacts the cue ball on a non-center hit, no (unintentional slippage between the cue tip and the struck ball) occurs. Cue tip chalk is not actually the substance typically referred to as "chalk" (generally calcium carbonate, also known as calcite or carbonate of lime), but any of several proprietary compounds, with a silicate base. It was around the time of the Industrial Revolution that newer compounds formed that provided better grip for the ball. This is when the English began to experiment with side spin or applying curl to the ball. This was shortly introduced to the American players and is how the term “putting English on the ball” came to be. "Chalk" may also refer to a cone of fine, white ; like talc (talcum powder) it can be used to reduce friction between the cue and bridge hand during shooting, for a smoother stroke. Some brands of hand chalk actually are made of compressed talc. (Tip chalk is not used for this purpose because it is abrasive, hand-staining and difficult to apply.) Many players prefer a slick pool glove over hand chalk or talc because of the messiness of these powders; buildup of particles on the cloth will affect ball behavior and necessitate more-frequent cloth cleaning. Cue tip chalk (invented in its modern form by straight rail billiard pro William A. Spinks and chemist William Hoskins in 1897) is made by crushing silica and the abrasive substance corundum or aloxite (aluminium oxide), into a powder. It is combined with dye (originally and most commonly green or blue-green, like traditional billiard cloth, but available today, like the cloth, in many colors) and a binder (glue). Each manufacturer's brand has different qualities, which can significantly affect play. High humidity can also impair the effectiveness of chalk. Harder, drier compounds are generally considered superior by most players. There are two main varieties of billiard games: carom and pocket. The main carom billiards games are straight rail, balkline and especially three cushion billiards. All are played on a pocketless table with three balls; two cue balls and one object ball. In all, players shoot a cue ball so that it makes contact with the opponent's cue ball as well as the object ball. Others of multinational interest are four-ball and five-pins. The most globally popular of the large variety of pocket games are Pool and snooker. English billiards, with some features of carom billiards, was one of the two most-competitive cue sports, along with balkline, at the turn of the previous century and is still enjoyed today especially in Commonwealth countries. Russian pyramid and its variants like kaisa are popular in the former Eastern bloc. Although a difficult and subtle game, some of the best players of straight billiards developed the skill to the balls in a corner or along the same rail for the purpose of playing a series of to score a seemingly limitless number of points. In light of these phenomenal skill developments in straight rail, the game of balkline soon developed to make it impossible for a player to keep the balls gathered in one part of the table for long, greatly limiting the effectiveness of nurse shots. A (not to be confused with , which pertains to the game of English billiards) is a line parallel to one end of a billiards table. In the games of balkline – 18.1 and 18.2 (pronounced "eighteen-point-two") balkline, among other more obscure variations – the players have to drive at least one object ball past a balkline set at 18 inches (460 mm) from each rail, after one or two points have been scored, respectively. There are many variations of games played on a standard pool table. Popular poll game include eight-ball, nine-ball, straight pool and one-pocket. Even within games types (e.g. eight-ball), there may be variations, and people may play recreationally using relaxed or local rules. A few of the more popular examples of pool games are given below. In eight-ball and nine-ball, the object is to sink object balls until one can legally pocket the winning eponymous "". Well-known but waning in popularity is straight pool, in which players seek to continue sinking balls, rack after rack if they can, to reach a pre-determined winning score (typically 150). Related to nine-ball, another well-known game is rotation, where the lowest-numbered object ball on the table must be struck first, although any object ball may be pocketed (i.e., combination shot). Each pocketed ball is worth its number, and the player with the highest score at the end of the rack is the winner. Since there are only 120 points available (1 + 2 + 3 ⋯ + 15 = 120), scoring 61 points leaves no opportunity for the opponent to catch up. In both one-pocket and bank pool, the players must sink a set number of balls; respectively, all in a particular , or all by . In snooker, players score points by alternately potting and various special "". Eight-ball: The goal is to () all of one's designated of balls (either vs. , or vs. , depending upon the equipment), and then pocket the in a pocket. Nine-ball: The goal is to pocket the 9 ball; the initial contact of the each turn must be with the lowest-numbered remaining on the table; there are numerous variants such as seven-ball, six-ball, and the older forms of three-ball and ten-ball, that simply use a different number of balls and have a different . Straight pool (a.k.a. 14.1 continuous pool): The goal is to reach a predetermined number of (e.g. 100); a point is earned by pocketing any called ball into a designated pocket; game play is by of 15 balls, and the last object ball of a rack is not pocketed, but left on the table with the opponent re-racking the remaining 14 before game play continues. Dating to approximately 1800, English billiards, called simply billiards in many former British colonies and in Great Britain where it originated, was originally called the winning and losing carambole game, folding in the names of three predecessor games, the winning game, the losing game and the carambole game (an early form of straight rail), that combined to form it. The game features both (caroms) and the pocketing of balls as objects of play. English billiards requires two and a red . The object of the game is to score either a fixed number of points, or score the most points within a set time frame, determined at the start of the game. Winning hazards: the red ball (3 points); potting the other cue ball (2 points). (or "in-offs"): potting one's cue ball by cannoning off another ball (3 points if the red ball was hit first; 2 points if the other cue ball was hit first, or if the red and other cue ball were "", i.e., hit simultaneously). Snooker is a pocket billiards game originated by British officers stationed in India during the 19th century, based on earlier pool games such as black pool and life pool. The name of the game became generalized to also describe one of its prime strategies: to "" the opposing player by causing that player to foul or leave an opening to be exploited. In the United Kingdom, snooker is by far the most popular cue sport at the competitive level, and major national pastime along with association football and cricket. It is played in many other countries as well. Snooker is uncommon in North America, where pool games such as eight-ball and nine-ball dominate, and Latin America, where carom games dominate. The first International Snooker Championship was held in 1927, and it has been held annually since then with few exceptions. 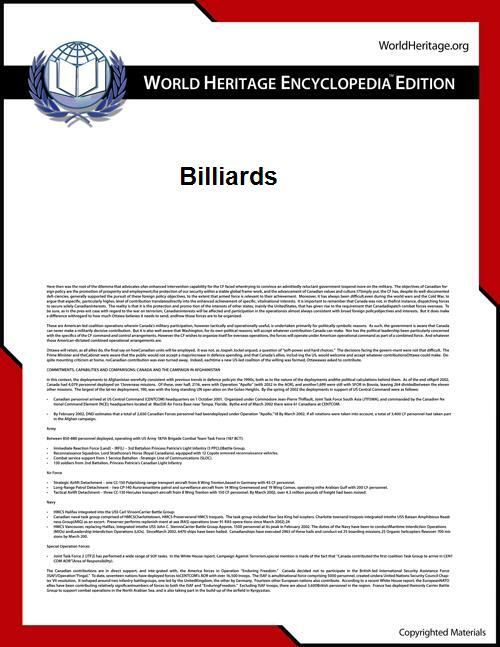 The World Professional Billiards and Snooker Association (WPBSA) was established in 1968 to regulate the professional game, while the International Billiards and Snooker Federation (IBSF) regulates the amateur games. Commons has media related to Billiards. Pool Playing Tips - Tutorials on Billiards or Cue ball.